Cars, each with their own paint and lettering scheme for the Nepomuk the Half Dragon, Mrs. Mahlzahn, and the Wild 13. Take the movie characters Nepomuk, Mrs. Mahlzahn, and the Wild 13, which are included as cutout sheets in the car set along with you on the trip. 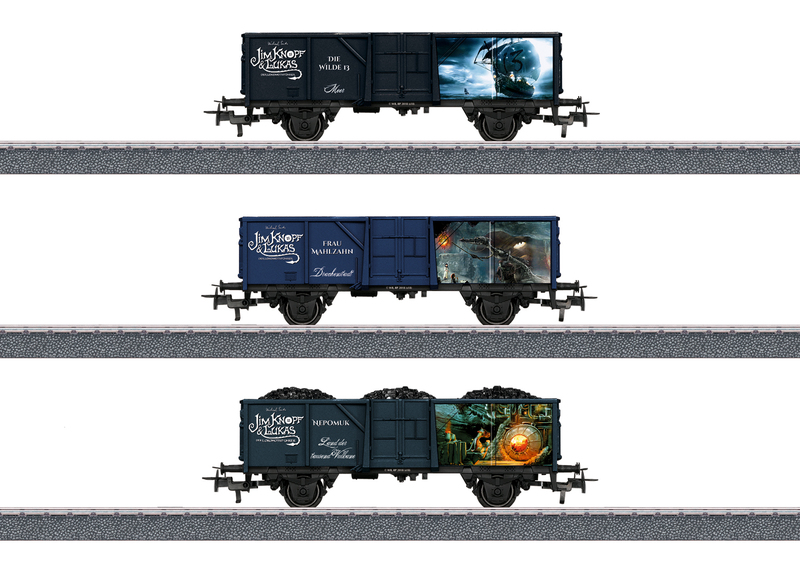 Model: The car set has 3 gondolas, each with its own paint and lettering scheme for Nepomuk from the Land of the Thousand Volcanoes, Mrs. Mahlzahn from the Dragon City, and the Wild 13 from the Sea. The Nepomuk car has a removable insert as a load of lava rock. The cars have an appealing product design with different elements to go with the theme "Jim Button and Lukas the Locomotive Engineer". 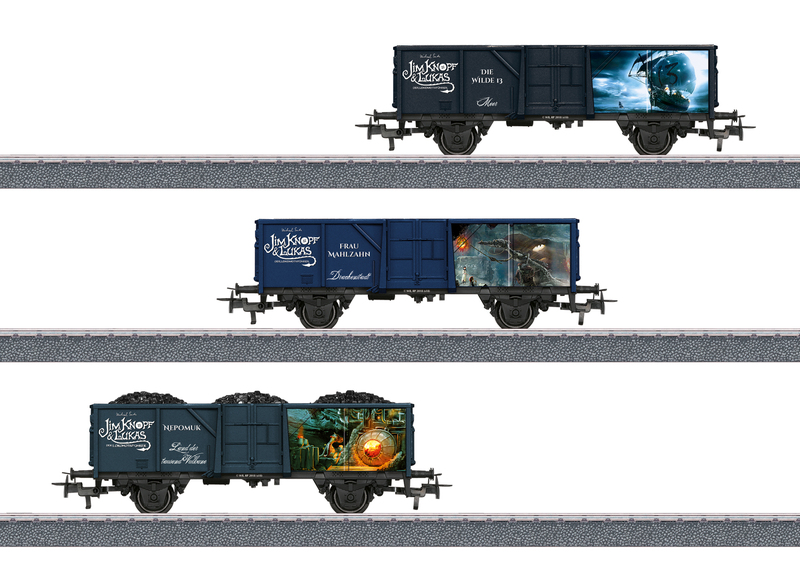 The car set has the movie characters Nepomuk, Mrs. Mahlzahn, and the Wild 13 as cutout sheets for additional play value. These characters are known from the movie "Jim Button and Lukas the Locomotive Engineer". These characters can be placed as figures in each of the cars. The cars have Relex couplers. Length over the buffers per car 11.5 cm / 4-1/2". All of the cars are individually packaged. DC wheel set E700580. The trip begins ... start the trip with the cars and the movie characters belonging to them and start your adventure for the theme "Jim Button and Lukas the Locomotive Engineer". The 44815 and 44816 car sets have additional, unique car designs and more movie characters for you to discover.